Sponsored by Northeast Community Council, Scenic Foothills Community Council, Anchorage Parks & Recreation and Anchorage Park Foundation. Grab your skates and head to East Anchorage’s newest park, Chanshtnu Muldoon, to check out the new ice skating loop and inclusive playground! We’ll be celebrating with hot chocolate, music, and the UAA Seawolves. Join us for this free, family-friendly event! Find this beautiful new park at the southeast corner of the Muldoon and Debarr Road intersection, south of the Muldoon Mall. Take the new People Mover Bus Routes 10 or 25! Happy New Year! January SFCC meeting is canceled. Our usual meeting place at Wayland Baptist University is closed for the holidays and we will resume meetings there February 1. In the meantime, the Chugach Foothills Park Advisory Committee met December 28 to plan for next summer’s playground upgrade. More meetings will be scheduled over the next few weeks if you missed it. To receive updates on this 2018 park upgrade, send e-mail to sfcc@alaska.net. See new Chugach Foothills Park page on ilovemuldoon.com for more information. Scenic Foothills Community Council will not meet in January due to holiday scheduling conflicts. Next meeting 7 p.m. Thursday, February 2, in the auditorium at Wayland Baptist University. UPDATE: Passed unanimously by NECC Dec. 17, by the SFCC Jan. 7 and by the Anchorage Parks Commission Jan. 14. Scenic Foothills Community Council meeting, 7 p.m. Thursday, January 7, in the auditorium at Wayland Baptist University, 7801 East 32nd Avenue. Access via Old Muldoon Road off 36th Avenue, west of Muldoon Road. 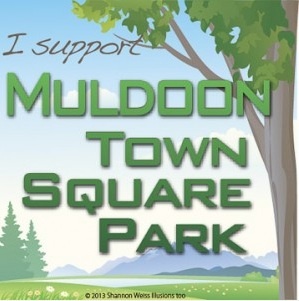 The Preferred Alternative for the Muldoon Town Square Park Master Plan is to be presented for a resolution of support. Bring your neighborhood concerns so we can seek solutions together. Everyone is welcome. See newsletter, agenda and minutes links above this post.